On our drive out to the village we stopped in Mt. Hagen to eat lunch and to buy some vegetables at the market. Mt. 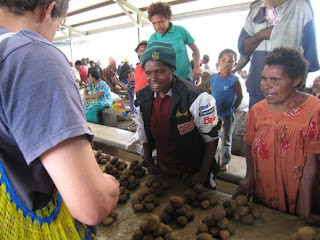 Hagen has the nicest market that I have seen so far in PNG – too bad it’s 5 hours drive away! Papua New Guinea recently released a brand new coin worth 2 kina. They’ve been taking out full-page ads in the newspaper for a while now, but there is a large percentage of the population that doesn’t read the newspaper. Gil had brought a whole roll of the new coins to do our market shopping, and we caused quite a stir. We had the privilege of introducing a new coin to that town (or at least the market). Every person we approached had the same rection. They looked at the coin skeptically, not convinced it was real. Each time we went through the same spiel, showing them the “2 Kina” printed on the coin, and assuring them that if they read the Post-Courier they would see an official announcement about it. Everyone eventually smiled and accepted it, except for the potato lady (the one in pink in the first picture). She stubbornly refused to accept it, even after a large crowd had gathered, taking turns looking at the coin. Finally, one man told us to take the potatoes. 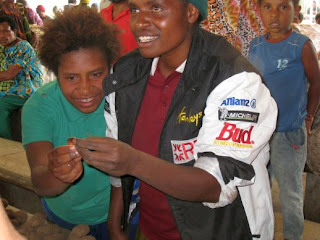 He took the 2 kina coin and gave a 2 kina bill to the woman.